In the fall of 2016, I was contacted by a client with an unusual project. She had a portion of a Christmas tree stump that was the site of her daughter Cara's engagement. Her idea was to create a Christmas tree ornament out of the stump to commemorate the occasion. After further collaboration, we came up with a design utilizing a portion of the stump -- a hand-scrolled sawed disk and heart. These are all stacked to create an accordion effect. The ornament is approximately 4" x 1" and is made from Pine, Orange Osage, and Mahogany woods. As an added bonus, I made the back portion detachable revealing a hidden picture and inscription. The ornament was finished in time for the happy couple's first Christmas together and will be a wonderful reminder for years to come. I custom carved a guitar with a Newfoundland theme. The guitar has a Newfie soundhole insert (see Custom Soundhole Covers and Inserts) and paw print fingerboard inlays. This is a tag I produced for the custom guitar's case. It matches the fretboard inlays. 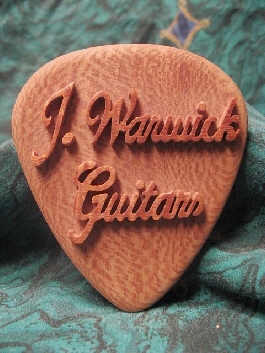 This guitar pic measures 4" high by 3" wide and is made out of Shenandoah Sycamore with Koa lettering. A maul is similar to a judge's gavel without the handle. It is used to call a meeting to order. 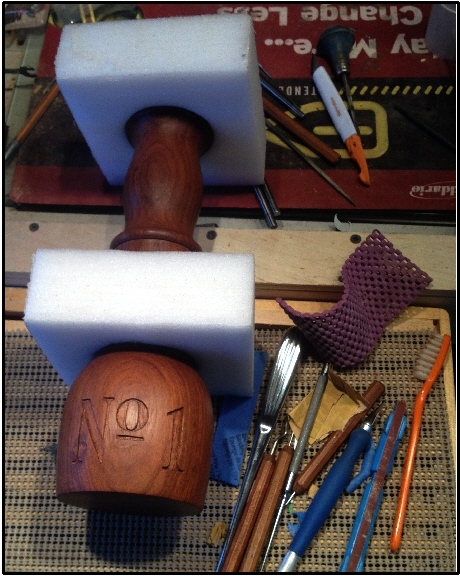 In the winter of 2017, I was commissioned to carve "No 1" into two mauls for the first Masonic Temple in Washington DC. 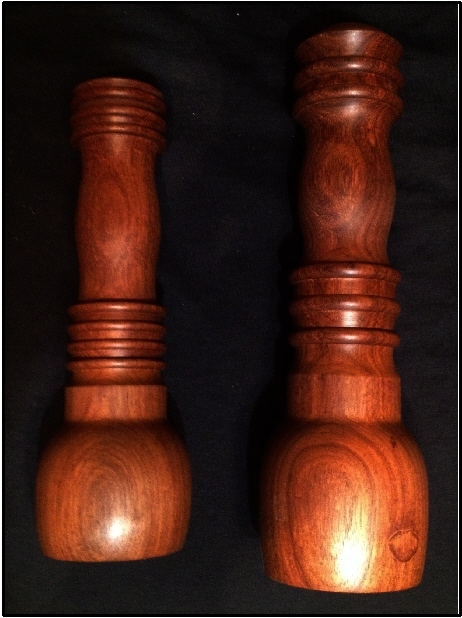 The mauls are solid Rosewood and were produced by Tom Boley at Red Oak Hollow Lathe Works. They are finished with Danish Oil and buffed to a high gloss. Every project presents it's own challenges. This one had two interesting challenges. The first challenge was how to hold the mauls while carving them. I solved this challenge using square blocks of foam with circles cut out. This allowed me to rotate the mauls for carving, while not have to hold them or worry about them rolling off of my bench. The second challenge was how to carve into a round surface which meant additional attention to detail. Since the maul is curved, I could not reference off of the face of the project for the depth of the carving. This meant no use of power tools -- only knives and gouges. Mauls prior to carving, finishing and buffing. Carving in process. Notice the custom foam holders. This is the project that started it all....well almost. In 1997, I decided to make a bookmark for my wife. I had not carved in years, but I thought this would be a fun handmade project for Christmas. A wooden paint stirrer and an exacto knife were the all of the materials and tools used. That bookmark did not survive an encounter with one of our dogs. So, for Christmas 2011, I decided to recreate that project. My knowledge and skills have improved since 1997 and so I incorporated many features in this project. The main portion features Spalted Hickory front and back with a green/red/green center. The front and back lettering is scroll cut and the dog paws are multi-colored inlays. The holly is hand-carved and hand-painted and the finial is hand-carved Flamed Maple. This is a book mark worthy of the finest novel. In 2011, Trixie, our fifteen year old neurotic chow/sheltie mix, passed away. She was the second shelter dog we adopted. Trixie was near and dear to both my wife and I, but holds a special place in my wife's heart. I decided to commemerate her life by creating a locket for my wife. The locket holds two images of Trixie. 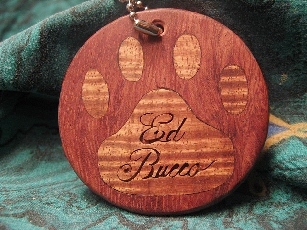 Her likeness is hand-carved Maple and the locket is Bloodwood with inlayed paw prints. The back of the locket has a scrolled inscription "Trixie, My Little Girl". Trixie may not be able to follow us around the house anymore, but she will never be forgotten and her spirit lives on in our house full of shelter dogs.